This is a simple explanation of how to pronounce past regular verbs. It also has a you tube video that I enjoy watching because it is very clear. 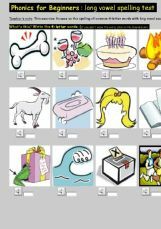 Online phonics/word recognition exercise with 20 pictures. 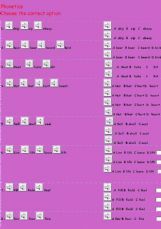 This exercise focuses on word recognition (mainly beginning consonants b/p, d/t, f/v). Targeted at (very) young learners and beginners. 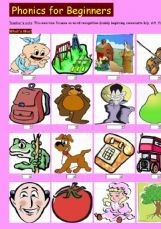 Phonics for Beginners: Short vowel sound exercise featuring 20 pictures (mainly 3-letter words CVC). Students click on the correct word; if they don�t know the word, they can click on the Sound icon to listen to it. 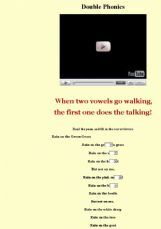 This exercise focuses on recognizing the vowel sounds only. Enjoy. 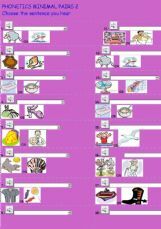 Spelling test for elementary students and/or young learners. 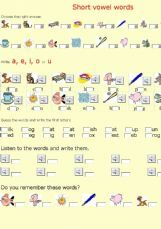 This test contains 20 pictures of 4-letter words with long vowel sounds (a,e,i,o,ai,etc.). 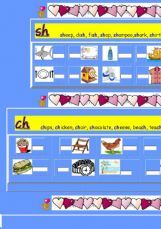 Phonics teaches students the relationship between letters and sounds (or phonemes), thus enabling them to become better readers and spellers. This test is aimed at testing the latter.